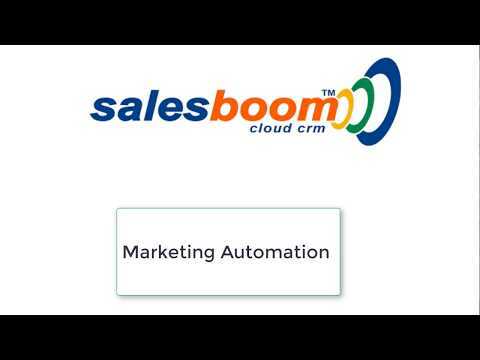 Salesboom on demand CRM Marketing Automation software will provide your marketing team with a view into the entire Customer Life Cycle automate and measure marketing campaigns, automate lead qualification and hand off to sales. Support the channel with campaigns created by real-time sales and support data. Analyzing and understanding how your campaigns are performing allows you to more accurately define those campaigns that work for you. With Salesboom's marketing software you can track the type of leads each campaign attracts, the types of products advertised, the volume generated by campaigns, etc. Tying every sales dollar back to a campaign source will justify your marketing dollars spent on campaigns. Salesboom's marketing software provides detailed Campaign, Contact and Lead tracking, reporting and analytical tools to give your team precise measurements on all types of campaigns from radio spots to newspaper prints. All leads are easily captured from different sources, and routed in real time sales software to specific team members based on your own business rules. You can ensure that all your hard earned leads get timely follow up. You now can systematically segment customers into groups based on customer information and other business rules to deliver unique marketing messages to each group. Salesboom's Online CRM Software is a central location for marketers to plan and efficiently manage all their marketing campaigns. A real time sales software view of responses to running campaigns ensures timely response from across your organization. More about web-based Campaign Management. Based on key attributes you can group contacts and leads onto lists or groups. Easily export lists in multiple formats to hand off to direct mail houses and partner agencies. Quickly send and track mass personalized e-mails to facilitate customer communication and lead cultivation. Segment lists into group to send personalized marketing messages. Use best practice and standard reports or instantly customize your own with point-and-click tools to gain critical insight into your lead generation campaign, win/loss reviews and customer trends. Remember, With Our CRM Marketing Automation feature, you will be able to market your product well with a reasonable price and an accurate guaranteed results. Maintain a targeted marketing campaigns based on clients profile and their buying history. Execute email campaigns to your prospects and current leads. Keep Track your marketing expenses in real-time. Improve and enhance the quality of your generated leads. Q. How can Salesboom help automate the processes within my Call Center with its Web-Based Call Center Software? Easy! Salesboom's Web-Based Call Center Software Solutions make a difference in every aspect of your Call Center Management software needs. We help fully automate everything from Marketing to Sales, Service & Support through Billing management and Invoice management, even Inventory Management and Web based Project Management ! From Pre-Sales to Post Sales, Salesboom has all your Call Center Software needs covered. Q. Does Salesboom have the Call Center Software Solutions experience to help my small business Call Center outperform our competitors? Definitely! Salesboom has been helping small business call centers since it was first designed - in fact, it was originally designed and compiled as an internal solution for a small call center environment. We've been in the business of helping your small business call centers since our very first release - you can trust Salesboom for all your small business call center software solution needs! Q. What areas of my contact center can Salesboom's contact center management software help me automate? Salesboom has many modules to help you automate your contact center. From Salesboom's Web-Based Campaign Management Software for your Marketing Team, Lead Management, Account & Web based Contact Management and Opportunity Management for your Sales team, Opportunity Management, Contract Management, Customizable Reporting and Analytics for your Management Team, to Billing management & Invoice management, Inventory Management, and Web based Project Management for all your back-office employees, Salesboom is a complete end-to-end solution for your Contact Center Software Solutions. Q. How does Salesboom guarantee my data is secure? Salesboom.com is able to achieve better security than your current system as our significant investments in security are shared by all of our customers. We are the only on demand CRM provider to provide a service level agreement with every license. Salesboom goes through the same processes and uses the same technologies as with online banking to ensure the utmost of security and peace of mind for our customers. Our industry leading uptime statistics are publicly available from www.salesboom.com in real time. Salesboom has 128-bit encryption (highest available) that encrypts every piece of customer data. The data is backed up daily to a hot backup and is routinely archived off-site. We are partnered with the largest ISPs and host our servers in their data centers for world class network and physical security. The hidden dangers currently present in every organization today is the data currently stored on your PC as it is very vulnerable to viruses, phishing attacks, etc and not monitored very well. Salesboom.com and our ISPs monitor our system 24/7/365 to detect security threats. Q. What if Salesboom Goes Down? Salesboom has multiple levels of redundancy and has one of the best up-time record in the industry so that almost never happens. See our system status link on our home page at www.salesboom.com . As well Salesboom is the only on demand CRM player to offer a Service Level Agreement guarantee of 99.8% uptime.